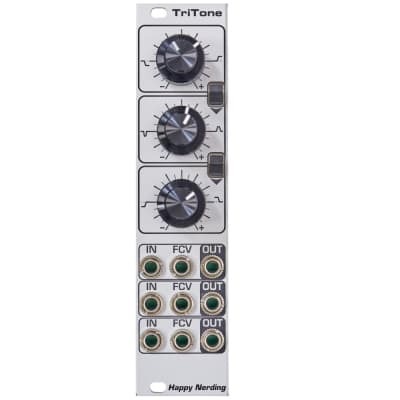 TriTone is a three section EQ plus saturator. Inner knobs control frequency and outer knobs control +- gain. All these sections Hi Shelf, Band Pass and Low Shelf are having + 20 db of gain and 30 db of reduction. Each section can work independently or they can be serially connected by the switches. Middle input in each section accepts CV for its frequency, so all three sections can be individually FMed by the external CVs. If the inputs are fed with the modular level signals (+- 5V), then there is little room for “plus” EQ gains before saturation starts. In this case the input level should be attenuated first, if saturation is not desired and much “plus” gain is needed. Otherwise saturation drastically enriches the tone and the module works like very flexible overdrive FX. When the switches are set to upper positions, then all three sections work independently. With the maximum gain reduction (CCW position) of the upper section (Hi Shelf) it becomes a useful kind of Low Pass filter. On the contrary – maximum gain reductions of the lower section (Low Shelf) makes it a High Pass filter. Please note the internal routing done by the switches: the output of the uppers section is added to the input of the subsequent lower section. If nothing is connection to this lower sections’ input, then only the upper section’s output is processed. This makes it a 3 band EQ with the switches set to lower position. Having separated inputs opens up more possibilities over ordinary EQs.